Opera says its VPN service exists as an independent company, operating under strict Canadian privacy laws. In April, Opera added a free, unlimited VPN to the developer edition of its browser. Now, the company has brought that same capability to the stable version of its Opera 41 desktop browser. While some other VPN services charge for letting you surf anonymously across the web, Opera’s service is both free, unlimited, and built right into the browser. There are no restrictions on bandwidth, though you’ll have just a few locations to choose from when deciding on your VPN endpoint. Why this matters: Opera represents just a tiny fraction of the browser market, but the company has been impressively aggressive in rolling out customer-friendly features: native ad blocking, battery saving, and more. In some ways, the company is the T-Mobile of the browser world, attempting to upend more-entrenched competitors by giving customers a number of tantalizing free features. 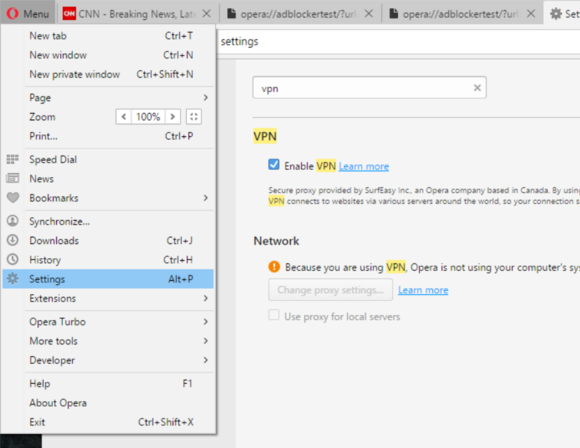 To enable the new VPN service, first ensure you have the latest version of Opera. If you don’t see the VPN icon in your address bar, you will need to make sure the VPN option is toggled on in Settings. Now click the VPN icon in the address bar to reveal its settings. To enable the VPN, first make sure it’s turned on in the Settings menu. You will see that the VPN service is on, as well as how much data has been transferred this month. You can select from a list of five locations for the endpoint, including Canada, Singapore, and Germany. You can also select an “Optimal” endpoint, which allows Opera to select the VPN endpoint based on the network speed, latency, location, and server capacity. Note: We used Opera’s existing, VPN-enabled developer browser for testing, and measured the page-load times using Opera’s built-in tool to load the same page with and without ads, simultaneously. Though we were measuring a live site, with theoretical variations in the ads displayed, we’re assuming a consistent experience. Your results may vary, however, due to changing conditions in network traffic and available server resources. A test of Opera’s VPN endpoints reveals drastic differences in page load times, as measured by Opera’s own internal tool. As we proved during the Olympics, however, using a VPN does have its benefits. While broadcasters such as the BBC ask visitors to confirm whether they’ve paid their TV license fee, other sites, like the CBC, don’t seem to mind. One concern, however, is whether your surfing habits will be truly anonymous. Opera was purchased by a Chinese conglomerate earlier this year, and there will always be some portion of the internet that believes that the Chinese government is peering over the shoulder of every Chinese product. SurfEasy also offers a paid service for Chrome and other browsers, which provides unlimited bandwidth for a monthly fee. Historically, the paid service has offered a greater number of endpoints and faster performance. Do you have to use Opera’s new VPN if you use the browser? Nope. 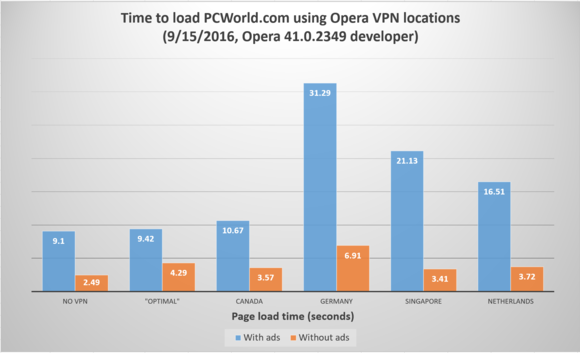 In fact the performance penalties suggest that enabling Opera’s new VPN on a 24/7 basis probably doesn’t make sense. But when you need to, combining private browsing (CTRL + Shift + N within Opera) together with the new VPN tunnel is a pretty good assurance that your online activities won’t be tracked.